"In the word “backpack”, there's “back”, and the back of this pack is really quite unique thanks to the Mobility Back System. The side placement of the shoulder straps, along with a pivoting hip belt, gives the impression that pack and carrier are one. The UBIC 45 MBS moves in sync with its athlete. 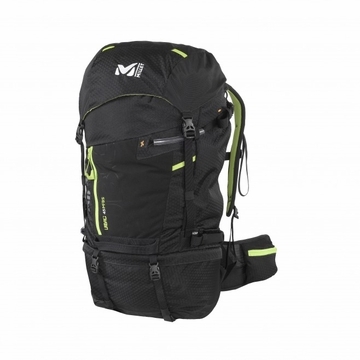 Derived from research by MILLET’s design center, this pack frees up your hips and torso. “We worked hard on the exact spot to position the rotation point, to gain the greatest benefit,” explains product manager Michèle about the hip belt’s raised pin. This Ubic is designed for a wide range of uses, with its innovative and versatile Variloop holder system. The model’s wraparound hip belt is also very popular. This contemporary pack breaks with convention and also stands out with excellent load adjustment. Built for: - carrying an ice axe - carrying your poles - carrying your snowshoes - carrying your skis - trekking, hiking, snowshoeing... Adventure!